Snow-covered valleys, deep blue winter skies and majestic mountains – a picture-perfect, idyllic white scene. 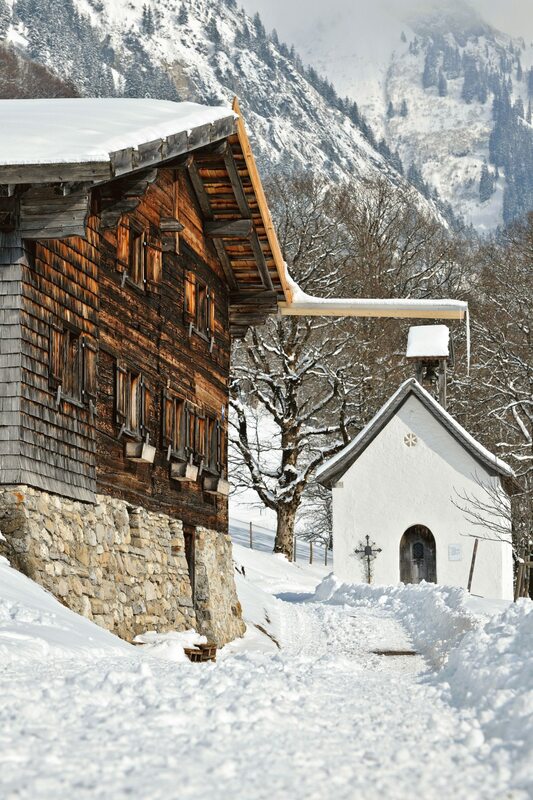 In the Oberstdorf valleys, winter really is as it should be. Enjoy the unique tranquillity found when the soft snow swallows almost every sound. the surrounding mountains. Returning to the circular trail, we now follow the ridge across wintry glades with idyllic views of Reichenbach. A forest trail gradually heads to Widum at the foot of the small mountain, from where the village road leads back to Reichenbach. There are two worthwhile little detours! Heading from Widum up to the Schöllang mountain church is very much recommended due to the beautiful view and the remarkable village chapel. After climbing to the Herrenholz, you should on no account miss the spectacular view of the Allgäu Alps. Starting in Tiefenbach, the winter hiking trail heads through the entrance of the Breitachklamm Ravine and straight into its depths. This is the deepest and, without a doubt, one of the most impressive rocky gorges in Central Europe. 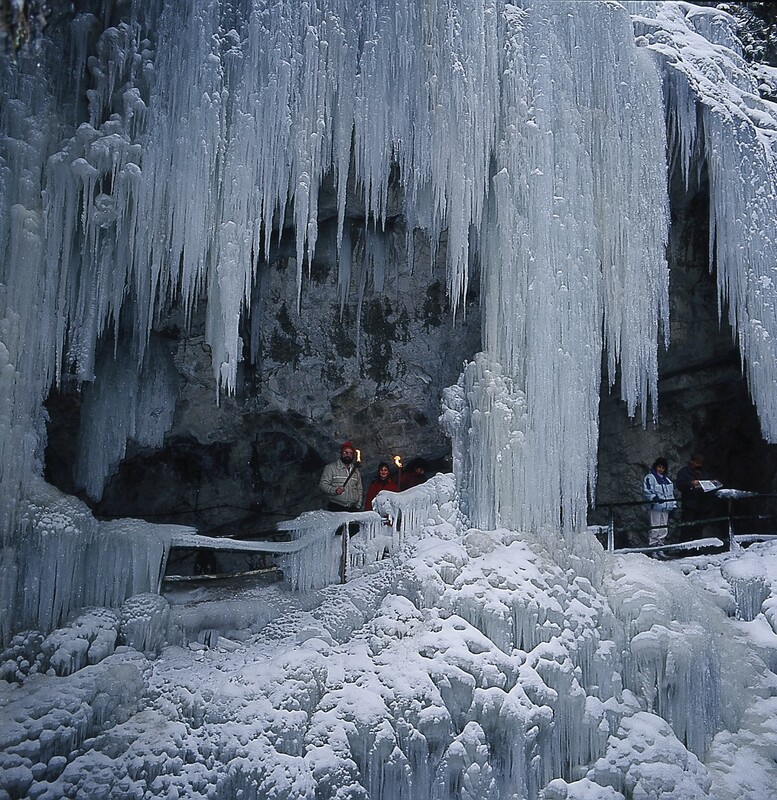 It is also one of the most beautiful natural geotopes in Bavaria, especially in winter when the frozen ice formations along the well-developed hiking trail that snakes it way through the ravine are an extraordinary natural sight. Close to the upper entrance is the only bridge across the Breitachklamm Ravine. Known as the “Zwingsteg”, this is definitely not to be missed! The views down into the thundering depths of the gorge are simply staggering. On the opposite side, a short climb leads up towards the Engenkopf. At the top, the route continues past the Alpe Dornach back to Tiefenbach. 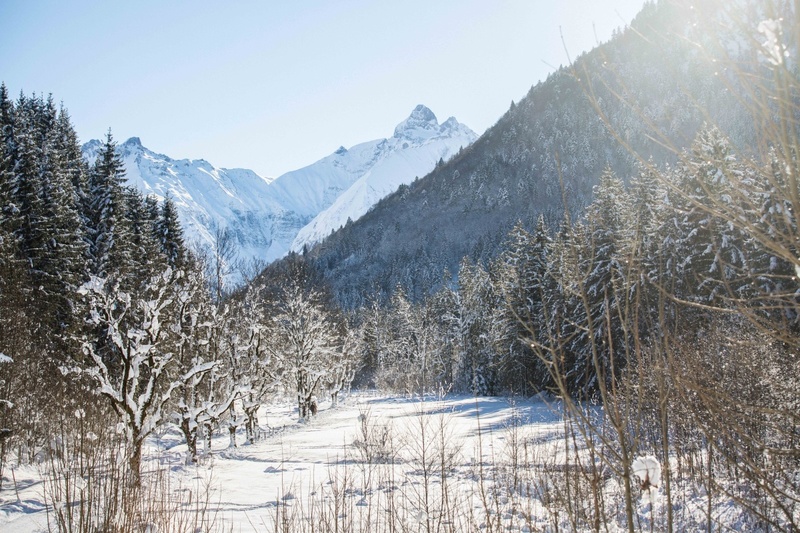 Alternatively, on reaching the Breitachklamm Ravine’s upper entrance, there are also other options for extending the winter hike into the Kleinwalsertal Valley. Regular buses return to Oberstdorf from the Walserschanze, the nearby border crossing. Night hikes through the Breitachklamm Ravine are offered twice a week in winter. Seeing the frozen ice formations by torch light is an extraordinary, almost mystical experience! At the west edge of Oberstdorf, the route heads over the Schlechtenbrücke Bridge to the Waldesruhe area, where you can visit the world’s first scientifically investigated energy site. The Bergkristallweg and Edmund-Probst-Weg trails then lead up to the Freibergsee Lake. At the top, a circular trail takes you all the way around the lake. If you want to extend the hike slightly or visit the Heini-Klopfer ski flying hill, you should now follow the route to the right. By taking the left-hand option, it is not long before you enjoy a lovely view of the lake. This is one of the highlights of the hike. The return route takes you through the forest on the north side of the Freiberg. Here, a short, slightly steeper section leads downhill to the lower Renksteg. After crossing the Stillach River, we return to a sunny stretch on the meadows to the south of Oberstdorf. You can avoid the ascent and descent by taking the bus to the Söllereckbahn valley station. The route can also be shortened by using the ski flying hill and Renksteg stops in the Stillachtal Valley. the Zwingbrücke bridge and the golf course, continuing past the idyllic Moorweiher to the Mühlenbrücke Bridge and Oberstdorf. Puzzle lovers should take a slightly closer look at the south side of the hunting lodge (first building on the right). The Zeigersattel is without a doubt one of the most riveting viewpoints to be found on winter hikes in the Allgäu! From the exit of the Höfatsblick summit station, follow the Zeigersattel signs to the right. Depending on the level of snowfall, the groomed winter hiking trail can vary slightly from year to year. We therefore recommend that you look for a sign right at the start of your hike. After leaving the Edmund-Probst-Haus behind you, the trail initially descends towards two Alpine huts. Just before reaching these, it veers to the left and leaves the ski area. After a short, gentle climb, we reach the Zeigersattel – and a fantastic view of the heavily snow-covered landscape of the majestic Allgäu Alps. The Höfats, also known as the queen of the Allgäu Alps, is just one of the countless impressive mountain peaks! To return, simply retrace your footsteps to the Nebelhornbahn cable car station. Note the avalanche warnings in our winter sports report. The trail may have to be closed temporarily in the case of a high avalanche risk. 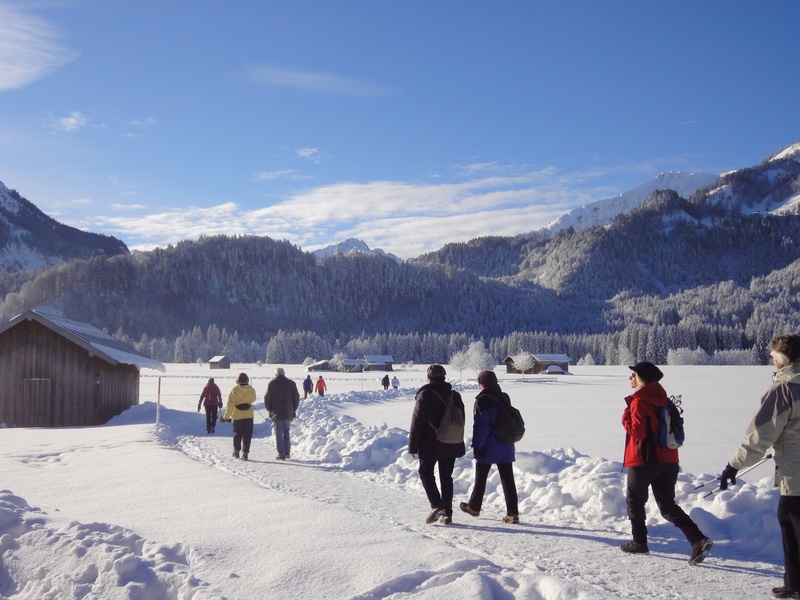 This winter hike passes the remarkable St. Loretto chapels on the southern edge of Oberstdorf and heads up the Burgstall climb to the Trettachtal Valley. After passing Germany’s southernmost golf course, glorious views open up as you head to the Christlessee Lake. 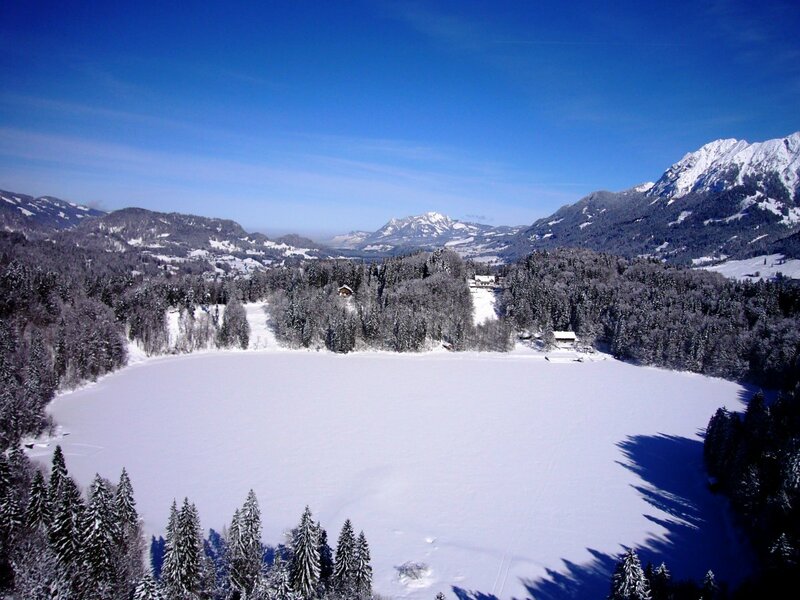 Even in winter, the mysterious, crystal-clear mountain lake with a cobalt-blue shimmer never freezes. This is because innumerable springs on its floor prevent ice from forming. The hike continues along the old Spielmannsauer Straße and over the Truppersoybrücke Bridge to Spielmannsau. 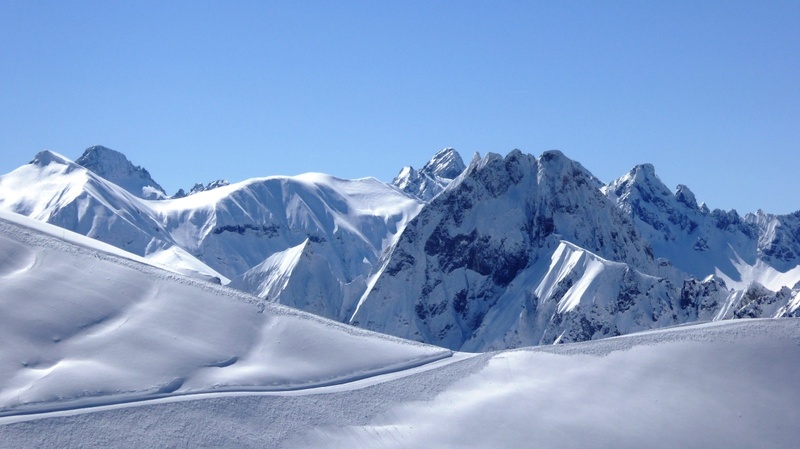 To the south, you can enjoy impressive views of the snow-capped peak of the Trettachspitze! In summer, this is the start of the popular Alpine stage of the E5 long-distance hiking route from Oberstdorf to Merano. In winter, only the return trail remains. Following the Trettach River, the trail continues to the bridge at Gottenried. 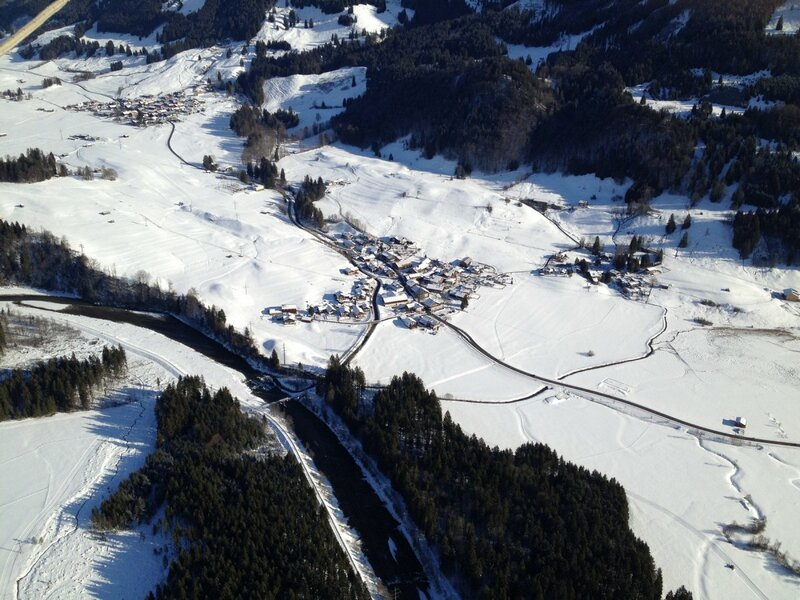 The Trettachtal Valley offers plenty of cosy and welcoming places to stop for a break! Treat yourself to some Allgäu specialities! All winter hiking and walking trails in and around Oberstdorf can be found on our website at www.oberstdorf.de/winterwandern.